Introduction: Parathyroid carcinoma is an uncommon malignancy. It accounts for less than 1% of cases of primary hyperparathyroidism. It is manifested by severe hypercalcemia and up to 50% of patients will have concomitant kidney or bone disease. 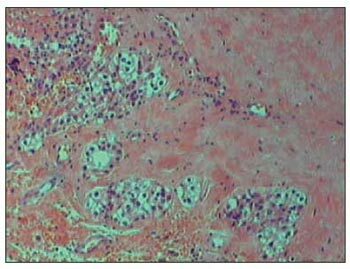 Case Report: In this paper we reported a case of parathyroid carcinoma in a 46 year old woman with elevated parathyroid hormone level, with kidney insufficiency and suspected tertiary hyperparathyroidism. Conclusion: The etiology of parathyroide carcinoma is unknown. The preoperative differential diagnosis between parathyroid carcinoma and primary hyperparathyroidism is often difficult because many of the signs and symptoms are very similar. The optimal surgical treatment is en bloc tumor resection with ipsilateral thyroid lobectomy. The course of patients with parathyroid carcinoma is variable. More than 50% have persistent or recurrent disease due to regional or distant disease. 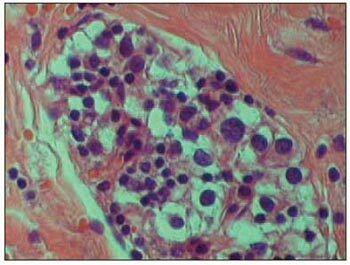 Parathyroid carcinoma is an uncommon malignancy, which was firstly described in 1904 by Quevain (1). It accounts for 1% of all cases of hyperparathyroidism (2) and 0.05% of the other neoplasm (3). It is a type of slow and progressive growth neoplasm, though with a high rate of recurrence. Men and women are equally affected (4), and usually during their fifth decade of life (4,6) opposing to adenoma that affects mainly women (4,5) in the sixth decade of life. Parathyroid carcinoma can be difficult to clinically and histologically diagnose due to uncertain criteria (5). Clinical symptoms arise from parathyroid hormone increase (PTH), which is mainly classified as general, bone and renal. Such carcinoma should be suspected in the presence of palpable parathyroid gland and increased PTH. In laboratory terms, it presents hypercalcemia and highly elevated PTH level. Parathyroid carcinoma may be suspected, but it usually cannot be confirmed prior to operation due to tumor features and surgical therapy. And poor results have been observed through radio and chemotherapy (4). Final diagnosis is mainly done through anatomopathological analysis. This study reports a case of a patient with tertiary hyperparathyroidism who was assisted in the ENT and Head and Neck Surgery department. Patient was submitted to parathyroidectomy. A 46-year-old female patient, black skin was submitted to parathyroidectomy. Patient had already undergone kidney transplantation 10 years ago, and presented tertiary hyperparathyroidism caused by chronic renal failure (CRF). She presented an increased amount of PTH (794.0 pg/ml, intact PTH: 2500.0 pg/ml) for more than eight months, 11.1 mg/dl Calcium and 1.32 mg/dl ionized calcium. Also, she presented a palpable cervical node in topography of the right inferior lobe of thyroid; of undefined limits; smooth; movable by deglutition and not painful at cervical hand manipulation. It was perforated, but insufficient material was obtained for diagnosing. She complained of speaking difficulty due to cervical pain. She presented pain on the inferior members, dialysis chronic renal failure, thrombocytopenia, systemic blood hypertension and systemic lupus erythematosus. She also reported fracture history of the left humerous around six months before. Imaging exams (axial CT and Magnetic nuclear resonance) showed a node on the topography of right inferior parathyroid gland of imprecise shape. It was difficult to evaluate the node limits or even if such node was from thyroid gland. Patient was submitted to surgery on May 27th, 2005. During surgical process, there was found a node on the right inferior parathyroid gland topography,. having close contact and with no cleavage plan with the right edge of the thyroid gland. Injury measured around 1.5cm; hard; irregular surface and grayish. 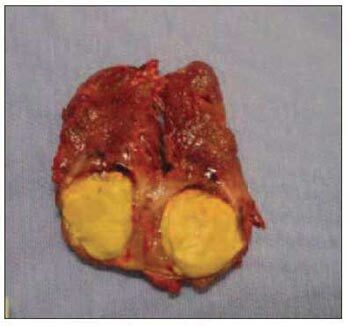 In that moment, it was suspected to be parathyroid carcinoma because of its bright yellow aspect and stone-like consistence (Picture 1). Such node was removed en bloc with the right thyroid lobe, and its freezing histological exam could not be conclusive. 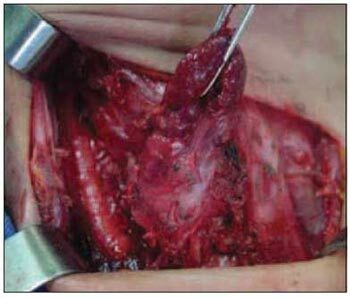 Then, total thyroidectomy; central cervical emptying (level VI); identification and removal of the right superior and left inferior parathyroid glands and implantation of left superior parathyroid gland fragments on right paraesternal muscle were performed. And it was not noticed cervical lymphnode increase during surgery procedure. Anatomopathological exam (Pictures 3 and 4) revealed a 1.6 x 1.2cm parathyroid carcinoma with necrosis area. The presence of capsule invasion was noticed adjacent to thyroid tissue and soft parts. Picture 3. HE. 100x. Infiltrative-like gland, filled up by intense fibrosis. Picture 4. 400x. Detail of gland proliferation, where enlarged cell's nucleus and enlarged amount of chromatin in the cell's nucleus are clear. Most times, diagnosis is done after surgery through histological study. Neoplasm can be suspected previously through laboratory and clinical findings such as palpable cervical mass accounting for 30-76% of cases, vocal fold paralysis or even through the presence of metastasis either distant or not (lungs, liver). The occurrence rate on patients with renal transplants and general population is similar. Clinical symptoms arise from parathyroid hormone increase and they can also consist of fatigue, weakness, weight loss, anorexia besides bone pain and renal symptoms such as nephrolithiasis (kidney stones and renal colic). In laboratory terms, it presents hypercalcemia, more evident than adnoma (usually above 14 mg/dl or 3 to 4 mg/dl above normal condition). PTH is 3 to 10 times over normal value. Adenoma presents less than 2 times of normal value. Alkaline phosphatase (ALP) is hardly increased (9,10). In the reported case, there was an expressive increase of PTH, mainly the intact one, opposing to calcium that was discretely increased, perhaps due to hypercalcemia procedures. During surgery procedure, some findings may help to distinguish between adenoma and carcinoma. They can be lobulated aspect; hard consistence; gray colour and adherence to adjacent tissues (4). Picture 2 is a photo taken during surgery procedure and it shows a great adherence of the parathyroid, mainly to the thyroid. The freezing exam is usually inconclusive. Schantz and Castleman, in 1973, described some histological criteria, which follow: a) capsule and trabecular fibrosis (Picture 3); b) trabecular cell structure; c) presence of mitosis (Picture 4) and d) presence of capsule or vascular invasion. However, none of those findings are classified as pathognomonic. Therapy for such dysfunction consists of extensive removal of the tumor en bloc under any suspicion of malignant neoplasm. Removal should comprehend the parathyroid, the ipsilateral thyroid lobe, isthmus and lymphnode of the central compartment (12,13). In the current case, the surgeon performed total thyroidectomy based on the aggressive aspect of the tumor. Cervical emptying should be only carried out in the presence of metastasis. Hypercalcemia must be highly controlled after surgery. Radiotherapy was not efficient and there was no sign of benefit from chemotherapy (14). Recurrence accounts for 50% of the cases three years after surgery in average. Death rate ranges from 51 to 78% in ten years (15), mainly due to hypercalcemia. The studied patient has been under laboratory follow-up for more than one year after surgery. She maintains PTH and calcium level in normal basis, with no clinical evidences or laboratory recurrence. Parathyroid carcinoma is rare and there is no consistent medical record of therapy on life or mortality rate. This refers to the small number of cases reported, what made analysis of patients difficult. It is difficult to diagnose it, and it should be suspected prior to surgery or even during in order to make therapy efficient. Recurrence is common, it is not the cause of bad development; rather uncontrolled hypercalcemia is the major cause to death. 1. de Quevain F. Parastruma maligna aberrata. Deutsche Zeitschr Chir 1904; 100: 34-52. 5. Kebebew E. Parathyroid Carcinoma. Current Treatment Options in Oncology 2001; 2: 347-54. 6. Holmes E, Morton D, Ketcham A. Parathyroid Carcinoma: a collective review. Ann Surg 1969; 169: 631-40. 10 - Silverberg S, Shane E, Jacobs T. Nephrolithiasis and bone involvement in primary hyperparathyroidism. Am J Med 1990; 89: 327-34. 1. Master degree student by FMRP-USP. Assistant doctor of the Head and Neck Surgery of the ENT Department at Hospital do Servidor Público Estadual de São Paulo. 2. PhD in Surgery Clinic by USP. Head of Head and Neck Surgery of the ENT Department at Hospital do Servidor Público Estadual de São Paulo. Member of the Teacher's Group of the post-graduation course in Health Science - IAMSPE. 3. Master degree in Health Science - IAMSPE. Assistant Doctor of the Head and Neck Surgery of the ENT Department at Hospital do Servidor Público Estadual de São Paulo. 4. Specialization degree student of Head and Neck Surgery by FMRP-USP. ENT Doctor. 5. Doctor expert in Otorhinolaryngology and Cervico Facial Surgery. ENT Doctor. This article was submitted to SGP (Publication Management System) of R@IO on May 8th, 2007 and approved on October 14th, 2007 at 14:06:28.